When Odell Beckham Jr. beat out Rob Gronkowski in a popular vote to determine the next player to don the cover of the iconic Madden videogame series, it probably represented the peak of his popularity, and the confirmation of just how much his unreal catches have resonated among football fans. Even in a down period for the New York Giants, Beckham represents the future of the franchise, and the hope of better days. That is, if he can beat out the Madden Curse, as well. It may be a bit dumb to think about it this way, but it is also fun and strange to consider having this honor turn into a potential booby-trap, as anecdotal evidence can point out to the many instances in which cover players suffered a bad turn following their appearance on the cover. In a way, it makes sense, as this spot is reserved to only the best and most visible players, trying to take advantage of their absolute peak. It would then seem natural that regression rears its ugly head, but the idea of the curse resides on the extreme circumstances many of these players have found after being on the cover. So how bad has it been for the cover boys, really? Today we take a chronological look at all the players that have appeared on the cover since 1999. Before that, all covers included only John Madden. The curse has failed to get to him, though, as he is enjoying his retirement with a net worth north of $200 million. Not bad for a guy who used to eat turkey on live TV. 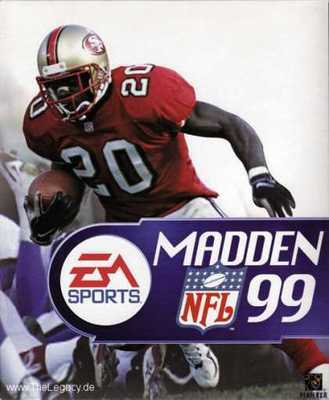 Hearst appeared only on a fraction of the total copies of Madden 99, as the coach himself was still prominently involved. The San Francisco RB was just coming into his own as a star ball carrier, and his demise was not immediate after his appearance on the videogame, as he led the 49ers to the playoffs with 1,570 yards on the ground. However, he broke his ankle on the first play of the Divisional playoff game, which the 49ers lost, and returned to the NFL until the 2001 season. This version of the game is kind of a myth, as it was never fully released following Barry Sanders' retirement before the season started. Trying to find a copy featuring Sanders can be a very expensive endeavor, but also a true collector's dream. Sanders may not fall into the curse per se, but his career as a whole may have been a cruel joke considering he squandered his talents in many lousy Detroit teams. In terms of yardage and touchdowns, George actually delivered the best season of his career in the year of release, so he may not be considered a natural victim of the curse. However, he did lose a critical fumble in that year's playoffs, leading to a Tennessee loss. The following seasons were not kind for the running back, as he suffered a steep decline that forced him out of the game by 2004. Still, that may have just been a product of aging and not a supernatural curse. Culpepper's 2000 season ranks as one of the best of this century, as he compiled 33 touchdowns and nearly 4,000 yards when that was a bigger deal. He was anointed as the league's next superstar QB, and earned the Madden cover. However, his cover season was cut short after just 11 games, during which he struggled and could only throw 14 TD passes vs 13 interceptions. Culpepper had a mini career resurgence in 2003-04, but was mostly a backup and emergency option after that. 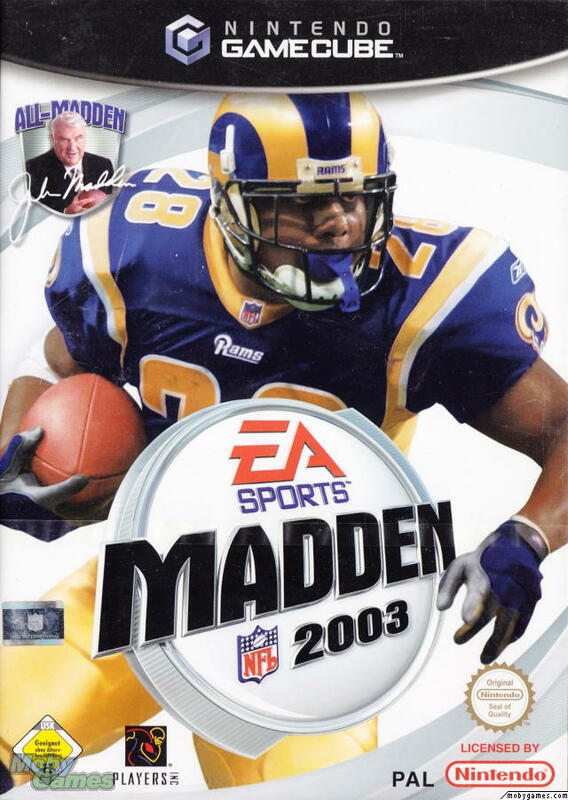 When Faulk earned his spot on the cover of Madden, he was fresh off 5 straight seasons with at least 1,000 yards rushing, and four straight with 700+ receiving. He was a two-time MVP at the peak of his powers, but the Madden curse and a natural process of entering his late 20's derailed him. An ankle injury forced him to miss five games during his cover season, and he would never rush for 1,000 or receive for at least 550 ever again. 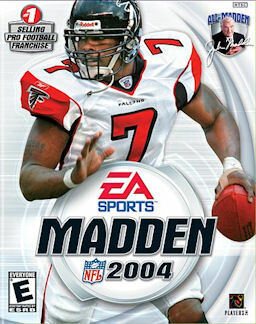 After emerging as an electric running quarterback that was thought of as the prototype for the future of the position, Vick was honored with the Madden cover. Just five days after the announcement, Vick was injured during a preseason game and forced to miss 11 games, derailing Atlanta's playoff hopes. Just as he was on his way to enter his prime, Vick was arrested for his prominent role in a dog-fighting ring, derailing his career. He would return and is technically still active, but odds are that he will be mostly remembered for his off-field problems than for his play on the field. Being the first defensive player on the cover, Lewis' nomination served as testament to the dominance of Baltimore's fearsome unit. Unlike his offensive counterparts, the curse turned out to be just a blip for Lewis, as he suffered a down season that saw him end without an interception and with the Ravens missing the playoffs. It was still a solid year for Lewis, who'd go on to play for 8 more seasons and win another Super Bowl. 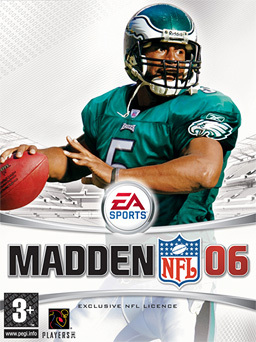 After guiding the Eagles to a hard-fought Super Bowl loss versus the Patriots, McNabb was supposed to be the chosen one in Philadelphia, and was a deserved recipient of the Madden cover honors. His cover season was marked by the QB trying to play through a sports hernia, as his yards per attempt fell by more than a yard and the Eagles regressed badly after a 13-win season. After a hard hit suffered against Dallas, McNabb chose to have surgery and miss the rest of the year. He would have a few more productive seasons in Philly, but his career ended with infamous tenures in Washington and Minnesota. 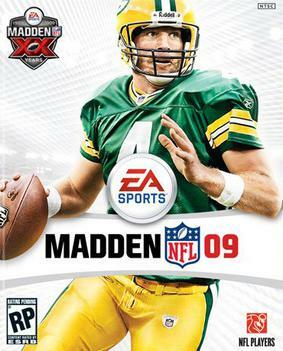 After earning MVP honors, Alexander was chosen to graze the cover of Madden 2007. However, he was 29 and about to enter the decline phase. Still, the drop-off was severe and painful, with Alexander breaking a bone in his hand to start his cover season, played in only 10 games, and could never recover. After scoring a then-record 27 touchdowns in a season, he would score just 11 for the rest of his career, and he was out of football two years later. Young was a controversial pick for the cover, as he was mostly known for his stellar college career than for his short tenure in the NFL. His cover season wasn't so bad, as he went 9-6 as a starter and made the playoffs, but the curse would get to him later. Despite battling nagging injuries, Young mostly delivered when he was on the field, but he was also derailed by character issues. Even with a 31-19 career record as a starter, he never got another chance after 2011. Favre's selection was supposed to be a tribute to his career after he had chosen to retire, but his abrupt decision to return forced the Packers, who were already set to give Aaron Rodgers the job, to trade him to the Jets. It all started well for Favre in his cover season, with New York storming to an 8-3 record, but the wheels fell off quickly for the legendary QB, as the Jets went 1-4 to end the year, with Favre throwing 8 picks vs only 2 touchdowns, and the Jets missed the playoffs. It was later revealed that Favre had nursed a shoulder injury, and he was also involved in a bizarre sexting scandal with a reporter while in New York. 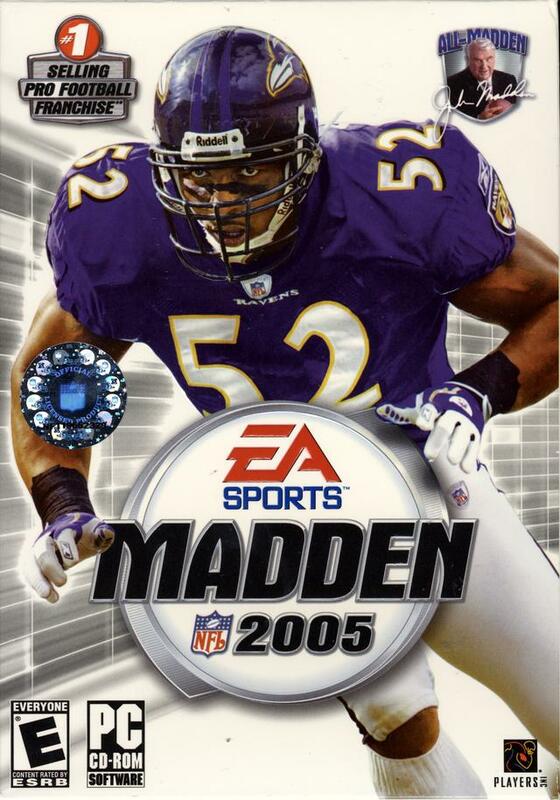 In the first time that two players were featured on the cover, Polamalu was regarded as the best defensive player in the league, while Fitzgerald was about to enter his prime. Alas, the curse hit quickly, with Polamalu suffering an MCL tear that was then aggravated upon his return, and forced him to miss the whole season. Injuries marked the rest of his career, and he just chose to retire. Fitz's fate was not sealed as quickly, but he has suffered through countless bad QB's in his time in Arizona. He has never been the same player that dazzled the world in the Cardinals' lone Super Bowl appearance. From a statistical standpoint, Brees hasn't really slowed down since his Madden cover season, and he is still mostly considered among the elite QB's of the league. However, that season saw him and the Saints lose to the 7-9 Seahawks in the playoffs, and then the curse had far-reaching effects with Bountygate, the Saints´ 2014 collapse, and the franchise´s current situation, in which the owner is in the middle of a legal battle for control of the organization. This was probably just a bad pick for a Madden cover, as Hillis was a break-out player in 2010 that had all the makings of a mirage. Still, his post-Madden performance has been an unmitigated disaster, with Hillis bouncing around 4 teams while serving mostly as a backup. After recording 1,177 yards and 11 touchdowns in his big season, he has combined for 1,258 and 6 in the following 4 campaigns. Even if Hillis was a natural candidate to fall back to earth, appearing on Madden all but sealed his fate. 1,681 yards and 16 touchdowns were the exclamation point that earned Megatron his place in Madden lore, as he has been one of the few players that have eluded the curse. His cover season saw him again lead the league in receiving, with 1,964 yards. His low TD total, which dropped to 5, was mostly explained by the tight coverages he saw in the red zone. Since then, he has remained an elite presence with the Lions, and is sitting at 5 straight seasons with at least 1,000 yards. 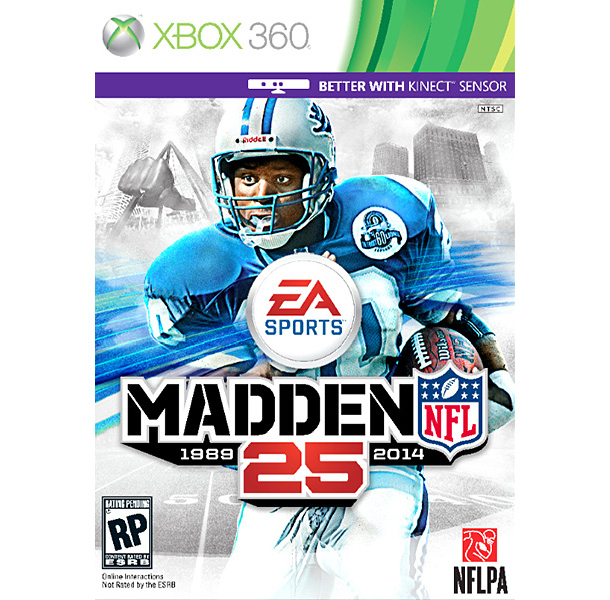 2014 – The game was renamed as Madden 25, alluding to the franchise's 25th anniversary and donned Barry Sanders as a throwback cover. Players were safe for a year. Just the second defensive player on the cover, Sherman rose to fame as the most visible member of the Legion of Boom and Seattle's fearsome defense that won the Super Bowl. His cover season of 2014 saw him regress a bit statistically, but that was mostly a product of opposing quarterbacks shying away from throwing to Sherman's side of the field. At age 27, he is poised to be among the best defenders in the NFL for a while. The curse may have reared its head when the Seahawks lost Super Bowl XLIX in heart-breaking fashion.